Redux is kind of ‘created’ to work with React.js but also can be used with Angular.js, Backbone.js or just vanilla JS. Also you may want to install the connection to React and the developer tools. Actions are created with action creators. They are just functions that return actions. // to send an action to the Store (The concept of Store will be seen ahead). While the actions describe that ‘something’ happen they don’t specify how our app reacts to that ‘something’. In Redux, reducers are functions (pure, I will explain what a pure function is later) that take the current state of the application and an action and then return a new state. Do actions with secondary effects like API calls or change a route. The name we put to the reducer is used as property of ‘store’ we created and is where will be saved the state returned from the reducer. Store is the object that holds the application state and provides a few helper methods to access the state, dispatch actions and register listeners. The entire state is represented by a single store. Any action returns a new state via reducers. Store the global state of the app. 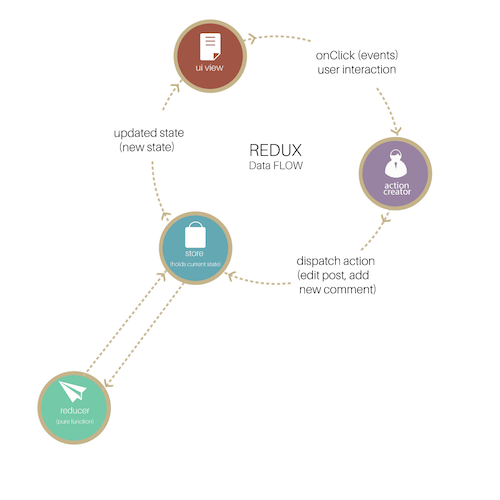 This image illustrates the work flow of Redux. The three principles of Redux. – Single data source: The app state stores in one objet tree inside a unique STORE. – The state is read only: The only way of change the state is through ACTIONS. – Changes are made with pure functions: To specify how the state tree is transformed by actions, you write pure reducers. Contrary of what you may be thinking, the only use of Redux isn’t with React. It can be integrated with any other library/framework like for example Vue.js, Polymer, Ember, Backbone.js or Meteor, but Redux plus React, though, is still the most common combination. First we need to encapsulate our app with the component Provider that comes with react-redux. This component receives a unique parameter called store which one is the instance of the STORE we are using. See the follow example. This component Provider defines in the global context of React our instance of store. Now is time to define what components are going to Access our Store, because not all of them will need to. In order to do that we need to connect our Redux components to Redux, this can be achieved with a decorator that came with react-redux called connect. // Aplying the decorator @connect to our component. // Rendering the user list we receive from Store  . This way our component UserList will have inside it props all the data of the Store. With this we can render our app using the data stored in the Redux Store. a) It always returns the same value when given the same arguments. b) It does not modify anything (arguments, state, database, I/O, ..). b) It performs an external operation, in other words it causes side effects. Example: A complete reducer with tests (can use a library for this like Expect.js). Having a predictable outcome and strict structure makes the code easier to maintain. Redux is stricter about how code should be organized, which makes code more consistent and easier for a team to work with. This is very useful, especially for the initial render, making for a better user experience or search engine optimization. Just pass the store created on the server to the client side. Developers can track everything going on in the app in real time, from actions to state changes. This is a huge plus whenever you’re learning or using any library or framework. Having a community behind Redux makes it even more appealing to use. The first rule of writing testable code is to write small functions that do only one thing and that are independent. Redux’s code is mostly functions that are just that: small, pure and isolated. return a new value based on arguments passed to them. They don’t modify existing objects; instead, they return a new one. These functions don’t rely on the state they’re called from, and they return only one and the same result for any provided argument. For this reason, they are very predictable. Because pure functions don’t modify any values, they don’t have any impact on the scope or any observable side effects, and that means a developer can focus only on the values that the pure function returns. Redux has a growing popularity and is even bigger every day. 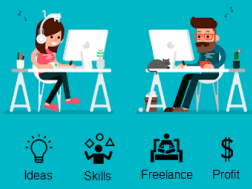 Companies like Uber and Twitter and projects like WordPress are using it successfully in production. 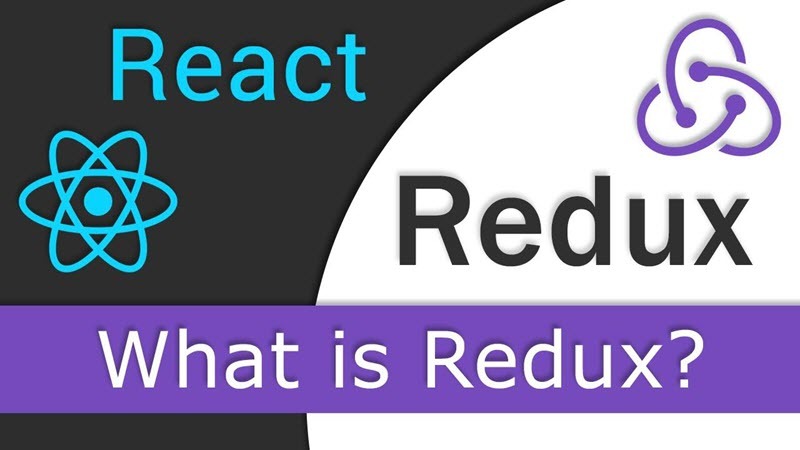 Redux isn’t a perfect fit for everything but we recommend to check it out. If you are up to it you can deep your knowledge over here, a tutorial from the Redux creator and see this example contains source code of Todo List app using Redux with React.